On the eve of the Birmingham Indoor Grand Prix in February 2001, a public spat erupted between Sebastian Coe and Linford Christie. The double Olympic 1500m champion slated his former GB team-mate in the Daily Telegraph and the ex-sprinter launched a furious counter-attack. It was a remarkable argument between two athletics legends and they continued to trade verbal blows 12 months later when Christie gatecrashed a BBC 5 Live radio programme where Coe was a guest to pursue his grudge. Mo Farah’s ill-judged, ill-tempered Twitter exchange with Andy Vernon on Tuesday wasn’t quite in the same league as Linford versus the Lord, but a spicy social media showdown between Britain’s top two distance runners certainly provides decent entertainment during the lull between the national indoor championships in Sheffield and Saturday’s annual grand prix in Birmingham. I’m loathe to take sides, but I do feel sympathy for Vernon as he only tweeted what many people have been privately complaining about for a long time – that too many of Farah’s domestic races feature soft fields. Like most of us, all Vernon wants to see is a competitive race, not a time trial. He wants to see the Olympic and world champion given a true test rather than a routine victory. Vernon’s initial tweet alone was not remarkable and did not lead to many retweets or much reaction. What caused the situation to explode, though, was Farah’s decision to bite and to take Vernon’s comment personally. As often happens on Twitter, the argument quickly escalated. Both athletes must surely have realised that an increasing number of people were reaching for the proverbial popcorn to enjoy the show. Saying that, this is an appropriate point to mention the theory that Farah’s Twitter account might very well be controlled by one of his team and that the 31-year-old instead spends his energy, quite sensibly, training. It is also worth mentioning than when it comes to healthy debates like this on Twitter, Vernon has some form. Last year he got tangled up in a similar row with Lynsey Sharp. In 2013 he accused Spanish athletes of cheating by using several starting pens at the European Cross Country Championships. But perhaps best of all he once accused “a drunken Ian Stewart” of swearing at him outside the Olympic Stadium. There is no spectacle we more avidly enjoy than watching two well-known characters kicking lumps out of one another in public. No doubt Farah will be quizzed about it all by journalists in Birmingham this weekend, too. But let’s not forget that amid the name-calling and handbag-swinging, Vernon raised a very good question. Are Farah’s races in the UK too easy? Of course Farah didn’t dodge anyone to win his Olympic and world titles. He also put his reputation on the line in last year’s London Marathon and who can forget his 2013 Great North Run mega-clash with Kenenisa Bekele and Haile Gebrselassie? Then again, Rocky Balboa was similarly unafraid to take on all-comers, but that didn’t stop his trainer, Mickey, from setting up a number of “hand-picked” opponents in between his battles with Apollo Creed and Clubber Lang. Please excuse the fictional Hollywood-related analogy. The point is, though, just like Sylvester Stallone in the Rocky movies, Farah probably doesn’t pick the rivals that he runs against. British Athletics puts together the fields, no doubt with a fair bit of help (or interference) from various managers and coaches. 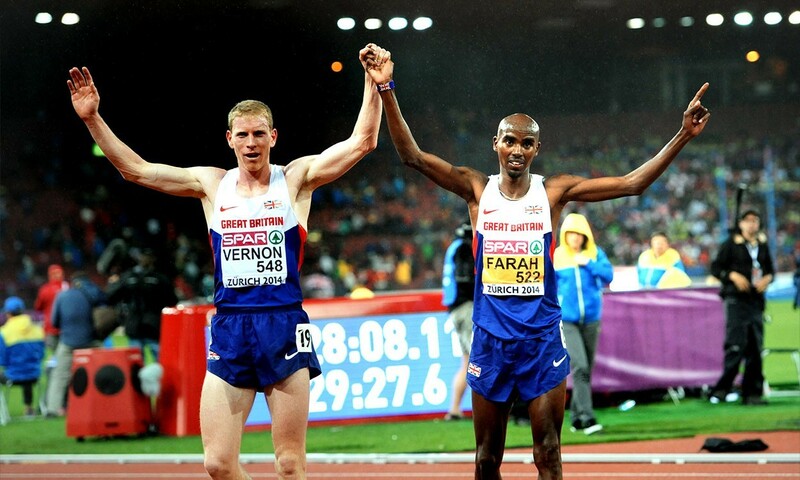 Don’t be surprised to see Vernon in future line-ups either, because the Aldershot man has suddenly gone from being Farah’s GB team-mate and European 10,000m runner-up to the grudge match rival everyone wants to see on the start line.